The UN's nuclear watchdog has said it will investigate US claims that Syria was building a secret nuclear reactor with North Korean help. The International Atomic Energy Agency criticised the US for withholding its intelligence until seven months after Israel bombed the site. The US said the alleged Syrian reactor "was not for peaceful purposes". Syria has said the US claim is "ridiculous" and has denied any nuclear links to North Korea. 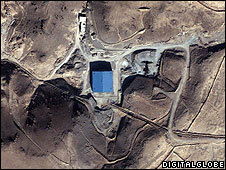 The site of the alleged reactor, said to be like one in North Korea, was bombed by Israel in 2007. The director general of the UN's International Atomic Energy Agency (IAEA), Mohamed ElBaradei, has now been briefed by the US on their claims but "deplores" the delay, a statement from the agency said. "The agency will treat this information with the seriousness it deserves and will investigate the veracity of the information," the statement said. The agency was critical of both the US delay in releasing the information and of Israel's bombing of the site before the IAEA could inspect it. "The director general views the unilateral use of force by Israel as undermining the due process of verification that is at the heart of the non-proliferation regime," the statement said. The statement is a clear indication that Mr ElBaradei is not accepting the US claims at face value and wants his own first-hand information, says BBC diplomatic correspondent Bridget Kendall. Syrian officials have said the site that was bombed by Israel on 6 September 2007 was an unused military facility under construction. Building on the site had stopped some time before the air strike, the Syrians said. On Thursday, American security officials showed members of Congress evidence they said proved Syria was building a nuclear reactor with North Korean assistance. Among the evidence they displayed were pictures - said to have been obtained by Israel - allegedly taken inside the facility showing the reactor core being built. The images showed striking similarities between the Syrian facility and the North Korean reactor at Yongbyon, the US said. 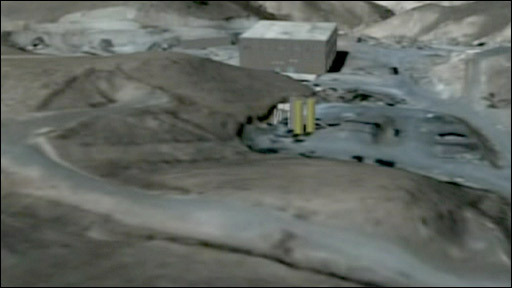 However, the facility was not yet operational and there was no fuel for the reactor, officials said. The White House said Syria's "cover-up" operation after the Israeli air strike reinforced its belief that the alleged reactor "was not intended for peaceful activities". In late October 2007, an independent American research organisation, the Institute for Science and International Security (ISIS), released pre- and post-strike satellite images of the site which indicated it had been bulldozed flat after the bombing. "Until 6 September, 2007, the Syrian regime was building a covert nuclear reactor in its eastern desert capable of producing plutonium," the White House statement said. "The Syrian regime must come clean before the world regarding its illicit nuclear activities." The statement added that the US had long been "seriously concerned about North Korea's nuclear weapons programme and its proliferation activities". Syrian officials have denied any North Korean involvement in their country. "These allegations are ridiculous," Syria's ambassador to the UK, Sami Khiyami, told the BBC. "We are used to such allegations now, since the day the United States has invaded Iraq - you remember all the theatrical presentations concerning the WMDs [weapons of mass destruction] in Iraq." 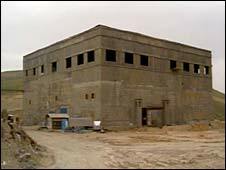 Mr Khiyami said the facility was a deserted military building that had "nothing to do with a reactor". Syria is a signatory to the Nuclear Non-Proliferation Treaty (NPT), which gives it the right to enrich its own fuel for civil nuclear power, under inspection from the International Atomic Energy Agency (IAEA). North Korea has previously denied transferring nuclear technology to Syria. The White House insists it is committed to the ongoing six-nation diplomacy, between North Korea and the US, China, Japan, South Korea and Russia that led to a landmark deal with Pyongyang, in February 2007. North Korea agreed to give up its nuclear weapons in return for aid and its removal from a blacklist of state sponsors of terrorism. But the US has accused Pyongyang of missing the deadline to make a full nuclear declaration as promised. The CIA briefing and statement coincided with the end of a two-day meeting between US and North Korean officials on Pyongyang's nuclear programme, which both sides say went well - fuelling speculation that a deal may be imminent. But questions are being asked whether the reactor claim is designed to reinforce those diplomatic efforts or an attempt by some in the administration to undermine them.